BJ’s: Come for the booze, stay for the Dancing Sandwiches! Hubba-hubba! I wish a sandwich would just dance itself into my mouth. Hot to Trot Dogs, yum! That’s a sandwich with a definite message! Don’t expect sissy sott white bread and gooshy mayo in this life, it’s saying. Things are firm, things are tough, things get stale and over-chewy around the edges! And watch out for buses. 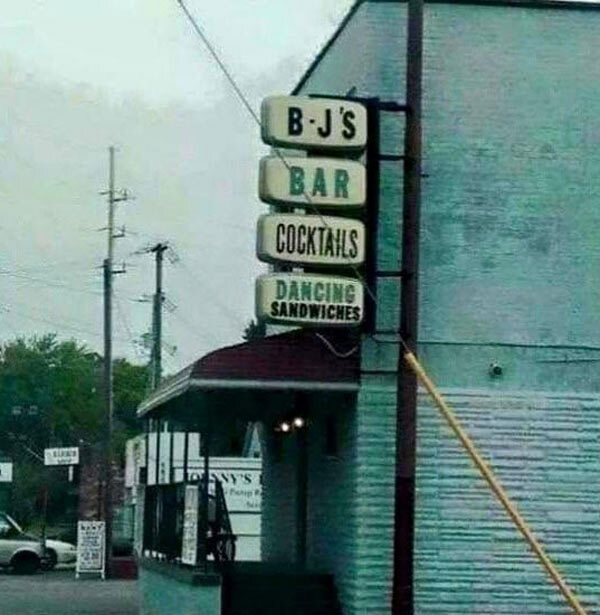 BJs, Bar, Cocktails, Dancing Sandwiches… The definition of a full-service establishment. Now if it only had a name.